This entry was posted in Fishing Stories and tagged Andy Rowe, Dustin Huff, Florida Keys, Permit, Seven Mile Bridge by Tarpon Slam. Bookmark the permalink. BoBo – having fished with Dustin, I’m not surprised. 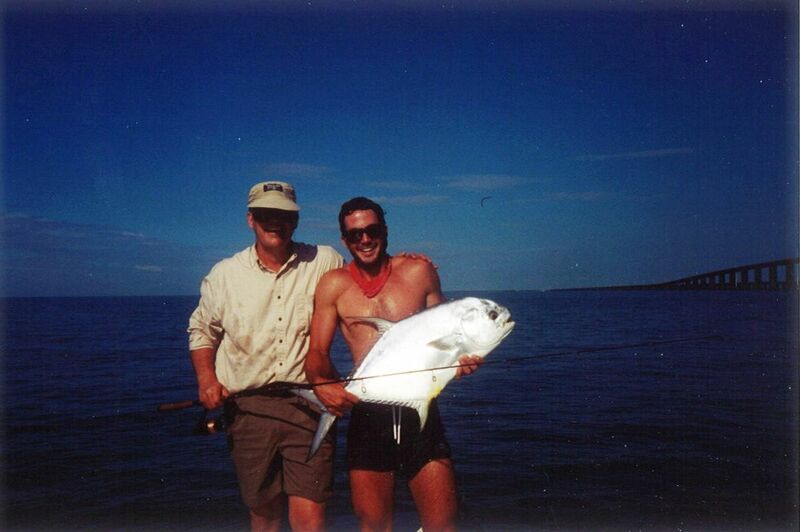 As you might recall, my first (and only) permit was caught off his boat. He is a great guy (de). What a great story! Feel bad for Andy on that one; hope he caught fish later. He did but he also fought a 100 lb tarpon on 10 lb test and a bonefish rod. 4 hours no fish. That will be the subject of a later post. I also have a pic of you and I perching where that bass jumper appears. You should expect to see that soon! great story son. I can see this ‘blog business will be fun. we’ll call mine : Preacher Man Tells All” Dad. Love the story about my Daddy! It would have pleased him so much. You are an excellent writer. I can hardly wait till more!